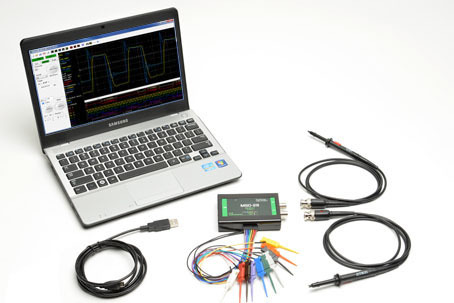 The compact MSO-28 operates as both a 2 GSa/s Oscilloscope and a 200 MSa/s Logic Analyzer. All channels sample simultaneously at a max rate of 200 MSa/s. At only $325, the MSO-28 includes probes, clips, wires, and software. It connects to any PC via USB. Being USB powered means, no external power supply is necessary. Following the successful deployment of the MSO-19 on the International Space Station (ISS), the MSO-28 was recently delivered to the ISS via Orbital Science's ORB2 mission to join the MSO-19 in expanding the debugging capabilities of astronauts on the ISS. All 10 channels are sampled at the same time and displayed together. This is better than using multiple separate instruments because the analog and digital waveforms are acquired with the same sample clock, assuring accurate time correlation between the two. Even through cabling two individual instruments together, samples would not be within 5 ns of each other, and the triggering would not be as tightly coupled as it would be with a single instrument. Since the software displays the oscilloscope and logic analyzer data on the same screen, it stays synchronized no matter how much a user scrolls or zooms. 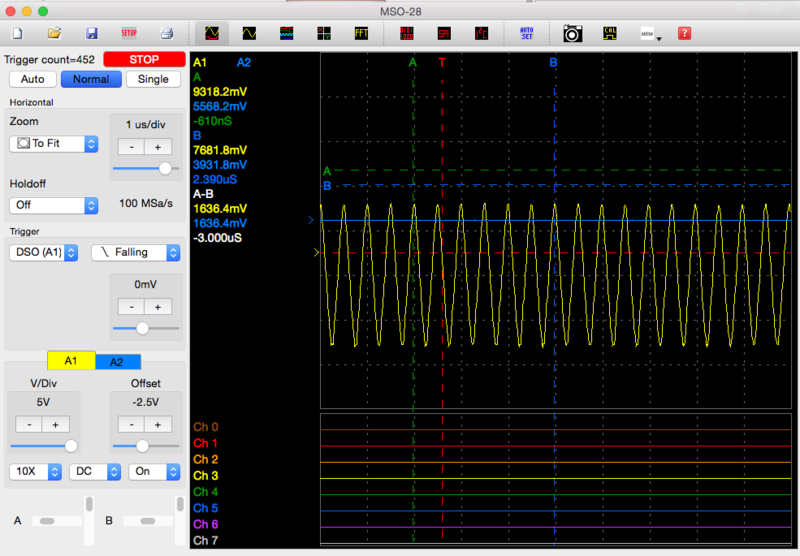 The MSO-28 can trigger on the Oscilloscope, Logic Analyzer, SPI or I2C inputs. All 10 inputs sample at the same time, and they are displayed together. The external trigger can be used to output to trigger other instruments. High-speed sampling is key to getting a good capture. An accurate capture of a 60 MHz signal can be obtained with the 200 MSa/s single shot sample rate and 60 MHz bandwidth. With RIS mode sampling, one can capture even faster signals. The FFT Spectrum Analyzer has controls for FFT window, FFT type, and FFT resolution. The software also supports averaging, memory, and plot subtraction. This allows for a whole range of spectral analysis, including: frequency response analysis, power supply noise analysis, etc. The maximum FFT frequency analysis is 100 MHz. Standard waveform measurements are included and can be displayed on the screen right next to the traces. Measurement results can be saved with the data files. 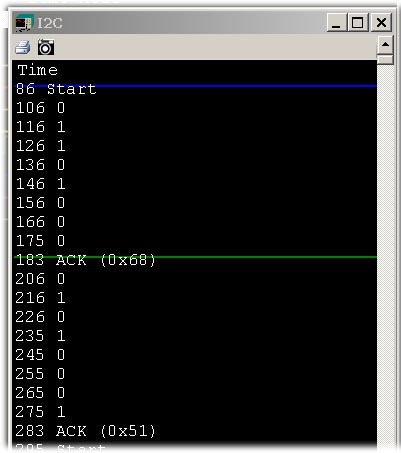 The MSO-28 can display and decode SPI and I2C serial bus protocols as well as trigger on them. SPI and I2C signals can also be viewed as timing waveforms and statelist-style displays. Perform sophisticated operations that cannot be done with a knob-based DSO. Screen shots can be pasted into documents and annotated in a preferred image-editing program. Users can paste screen images into their reports using programs like Word, Excel, image editors, etc. Data can even be shared with other computers. One can capture data in the lab and view it in your office or e-mail it to other engineers at remote locations for analysis. There is no need to be connected to our instrument in order to view a file. 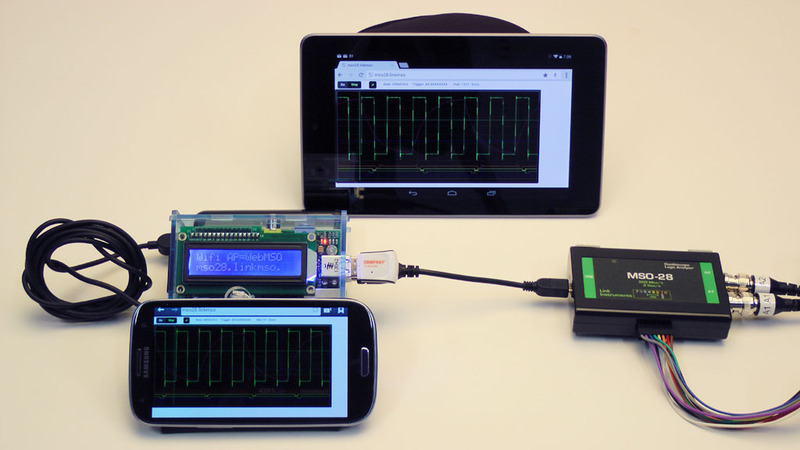 Stand-alone oscilloscope display screens represent a compromise at best. Few people would choose a 7" or 9" monitor as the screen for their PC. So why use a small monitor for an oscilloscope? Our software will also work with dual-monitor PCs. Imagine having a 30" wide trace window! All of the high-speed acquisition is done with the MSO hardware; the speed of a PC is not a factor. The PC is simply used for the display and user interface. If a PC is fast enough and has enough memory to run Windows well, it will also run our products well. The instrument has high-speed samplers and buffers. It can acquire information at up to 200 MSa/s and stores the data in its own internal data buffers. When these buffers are full, the data is transferred to the PC. In addtion to being Windows compatible, the MSO-28 control software is also available for OS X and Linux operating systems. Add a RaspberryPi or Intel Edison for remote operation via the web. 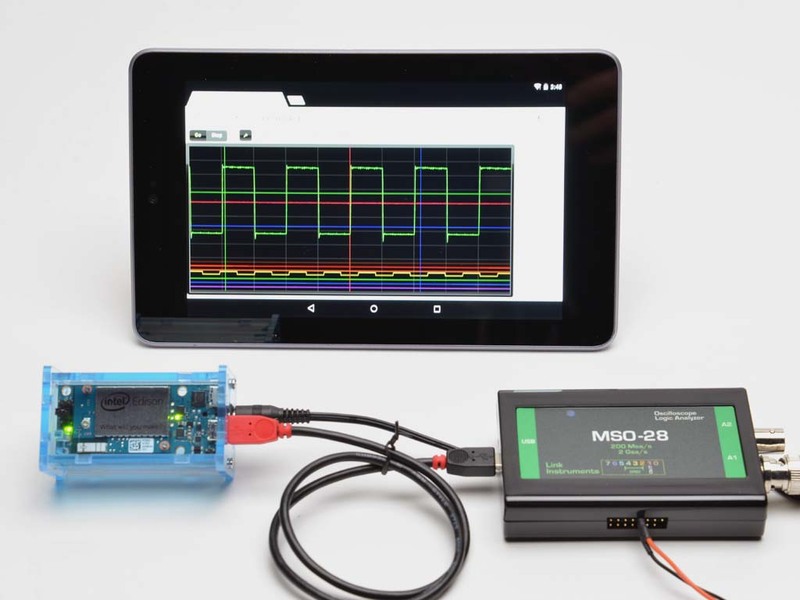 Control the MSO-28 remotely from your Android, IOS or web browser. Folllow the links to roll your own PiMSO and Edison-Scope. 0.098Hz to 195KHz depending on frequency range setting. Rectangular, Tapered Rectangular, Triangular, Hamming, Hanning, Flat top and Blackman-Harris. Magnitude, Power Spectrum, Power Density, Real and Imaginary. Any of the digital inputs can be used as an external trigger. Two 1x/10x switchable probes, LA wire harness and 10 clips are included. Shipping box: 9" x 6" x 2"